In the 80 allegorical etchings of Los Caprichos, Goya explores creative freedoms that were not acceptable to the conventions of art in his time. The works included in the exhibition can be divided into two groups. 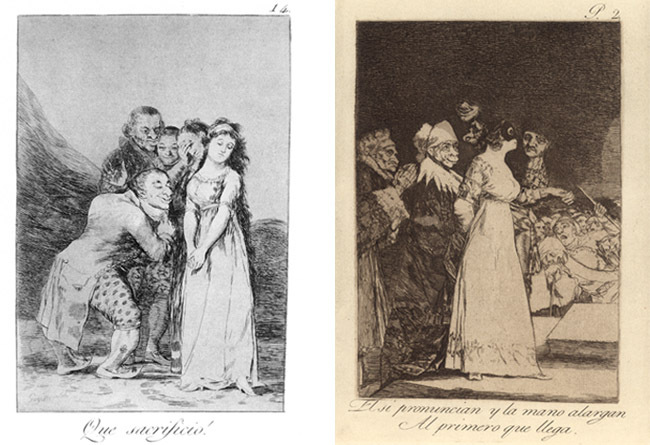 The first set of prints reflect Goya’s satirical depiction of human folly as he saw it in late 18th century Spain. Subject matter includes politics, the church, and even the Spanish royal family. Goya’s prints became social commentary at a time in Spain science and reason were the guiding principles, but deep-seeded corruption and privileged behavior in politics were the reality. The second set of prints from Los Caprichos introduce images filled with witches, ghosts, and fantastic creatures that may be considered to endear the mind in dreams but are nightmarish and suggest a world against reason. Goya was exploring the subconscious in these works, raising questions about reason and enlightenment and human nature. The suite precedes his more monstrous but better-known series, La Tauromaquia (The Art of Bullfighting, 1814-1816) and Los Desastres de la Gerra (Disasters of War, 1810-1820). This exhibition was organized for national tour by Contemporary and Modern Print Exhibitions, California.